This will be a quick post because I am getting my house in order for Christmas. There’s still vacuuming, laundry, polishing and food preparations to be done! Oy..I’ve made myself tired just thinking about it. I’ve had many request for this recipe and it’s finally here! It’s a bit late but I always say better late than never. 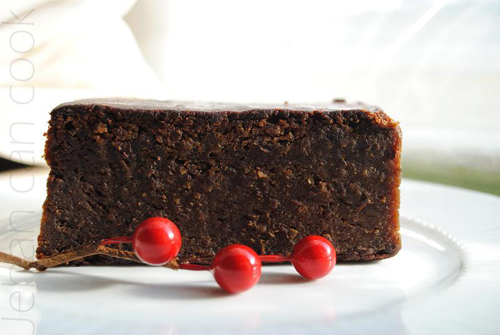 Black Cake is a staple at Christmas in Guyana and many countries in the Caribbean. This is also always served at a Guyanese wedding, always. 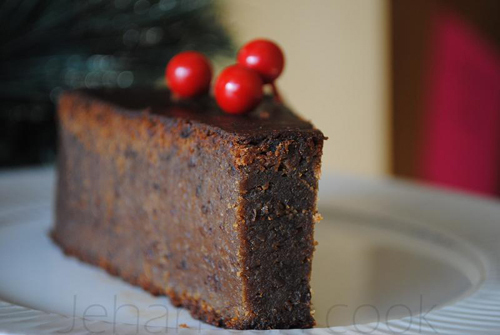 It’s a dense cake that’s made of dried fruits, nuts and rum. This cake is soaked in rum weekly and will keep for up to a month, as long as you keep adding alcohol. This will not only preserve the cake, but also keep it moist. My mom make a mean Black Cake and have been doing so for as long as I can remember. She’s bringing a pan from New York City all the way to Atlanta for me! I can hardly wait for her to get her tomorrow morning. As I leave you, I wish you all a Merry Christmas and a wonderful and prosperous New Year. Enjoy! Wash and grind all ingredients. This can done with a food mill or food processor. Mix in about 2 cups of rum or port wine and allow to sit for at least 2 weeks. Store in an airtight container. Preheat oven to 275 degrees. Grease and line two 9 inch baking pans with parchment paper; set aside. In a bowl, mix flour, baking powder, salt, nutmeg, cinnamon, mace and cloves; set aside. Place butter and sugar in a large bowl and mix until fluffy and light in color. Add eggs one at a time, mixing well after each addition to make sure egg is incorporated. Please don’t rush this step, adding the eggs too soon or too many at one time can cause the mixture to curdle or separate. Add vanilla extract and almond extract to mixture, mix until incorporated. Add fruit mix to wet ingredients and mix well. Add flour to wet ingredients, mix until smooth. Add caramel to achieve desired color and stir in rum. Divide equally between the 2 pans. Bake for 2 to 2 1/2 hours, test by sticking a toothpick in the center, cake is done if toothpick comes out clean. Remove from oven and pour about 1 cup of rum on each pan of cake. When the cake absorbs the rum, add more rum two more times. Add rum weekly. Enjoy! *To make your own caramel, add about 1/2 cup of sugar to a pan over medium heat. Sugar will melt and darken, added about 2 tbsp of red wine and cook until a deep dark color and it has reduces and thickens. Is there a substitute for rum in both black cake and fruit cake? You can use port as a substitute. Oops…thanks for pointing that out. I’ve updated the recipe. You add the fruits to the butter/egg mixture before adding the flour. Sorry Simone, I don’t have an egg free recipe. I want to eat this cake NOW!! Looks good. That is is good knife you use to cut that cake. Is it kay if you don’t have the caramel? Michelle the caramel makes gives the black cake it’s signature color. If you don’t add it, the cake will be brown in color. Can you recommend a brand of rum/port wine used for soaking the fruits as well as a brand of dark rum? Also, if I don’t use the caramel/food coloring, does the detract from the flavor? I can’t find any candied citrus fruit mix (I live in NC), so can you tell me the kinds of fruit peels and about how many of each I should use to make 1/4 lbs of the mix? Additionally, what is mace? Thank you for all your help. This will be the first time I’ll be making this. Hi Serena, I will try to help you as best as I can. I use any cheap rum or port wine to soak the fruits, it really doesn’t matter. Caramel does add to the flavor but it will hugely impact the color of the cake, it will not be black. Candied fruit peel can be found at Walmart in the section with dried apricots and raisins and such. It is made with citrus peels such as orange, lemon and citron and also cherries. I don’t have a recipe for you so it’s difficult for me to tell u exactly how much of each to use as I’ve never made my own. Mace is the membrane that surrounds the nutmeg that’s ground into a fine powder. It should be available in the spice aisle. I hope I’ve answered all of your questions. Oh, okay. I’ll go foraging in Walmart again and see if I can find the mixed fruit peels. Is the caramel the same one uses on a sundae? Thank you for all of your help! Hi Serena, the caramel is not the same as used on a sundae, it is caramel coloring that is used to color cakes and beverages such as coca cola. It get its dark color from burning sugar. If you google cake caramel it should provide you with websites that sell it. As a first generation Guyanese I did not get to learn all of these great recipes from my ancestors. Thank you for sharing this. I have already tried it and it came out great. I will add a back link to my blog for this post. Thanks you made my year! Thank you for sharing your recipe. It looks delicious, I’m going to make it right now, I have all of the ingredients. Ann this makes 2 pans of cake . Thanks. looks really good. I just finished making mine. I recall Mom using “High Wine” in addition to, or in place of rum. Any comments? What would be recommended ratio.? Dennis you can use high wine also. The amount would be the same. High wine will give the cake a stronger alcoholic flavor. Thanks for posting this recipe. I have one question- do I add all the fruits to the butter and egg mixture? Oops, I forgot to include add that you use 1 lb of the fruit mixture. Thank you for spotting that. Hi Jehan, I will actually get my fruits and start the soaking process this weekend. I’m excited to try this recipe! do you have a recipe for that delicious frosting our parents and grandparents made for the cake? I feel using the “American” frosting would just ruin the cake. Thanks! Mandy I font have a recipe but the icing that’s used on black cake is simply royal icing. It’s very easy to make and has just about 3 ingredients. Hi what is currants and do you know where can I find it? Also what is mace? I would really like to make this cake for Christmas and your look very nice and easy to do. Hi Jehan! My husband is Guyanese and I’m so glad I found your website! Thanks for your recipes, been using them for a while)) this year it’s my first time making the black cake and I have a question.. How thick the fruit mix should be? It’s being soaked in port wine since Wednesday and today it looks really thick, even though I added more than 2 cups of wine. Do I need to add more wine every week? Olga, it should be a thick paste. You do not need to add wine every week, only if it becomes dry. Hi Sheron, currants are like tiny raisins and can be found at your local grocery store by the dried fruits. Mace is the outer shell of the nutmeg and can be found in the spice aisle. Hi I am a bit confused. Your recipe says 1lb of the fruit mixture. In your comment section, it says all of the fruit mixture. Is it all or just one pound of the fruit mixture? Indira, as written in the recipe add 1 pound of the fruit mixture. hi.can you put the recipe for black cake in dutch. translation for me pleace . Azra, I don’t speak Dutch. I would like to know how much 1 lb of fruits would be equal to in cup measurements? Is it 2 or 3 cups? Natalie a pound of fruits should be 16 oz which is 2 cups. Hi Jehan, I love your recipes. Being a child of Guyanese parents, and now living far away from them for the first time in my life, these recipes have been helpful! I wanted to know for the citrus peels, is that just a mixture of lemons, oranges, limes, etc.? The Citrus peel can be found where you buy dried fruits. Its a mixture of various citrus peels that are candied. Thank you for the recipe but there’s one little problem. You said mix flour, baking powder, salt and all the spices but nowhere in the ingredients list does it say salt. How much salt is needed. Thanks for your attention. Sorry about that Colleen, add 1/4 tsp salt. how much caramel should you add, i have the pre made burnt sugar? Going to try this for Christmas! But is there a substitute for the citrus Peel? I can’t seem to find it anywhere. Lisa, I’ve never made it without citrus peel and don’t know of a substitute. I’m referring to the standard size which is 750 ml rum bottle. Anna, this is tricky. I didn’t add a measurement because some caramels are darker than others. You add the caramel until the cake is black but be very careful as adding too much of some brands caramels can cause the cake to be bitter. This loos so good and I would like to try it…..Do you have a icing recipe to go with the cake? Haleema, I don’t have a recipe, sorry. Nadira, I’m assuming that you can just leave out the alcohol but the cake will be very dry. The alcohol keeps it moist. Also, how many cups is equivalent to 1 pound of fruits? I LOVE black cake but sadly I have IBS and have problems with digesting wheat. I would love to make a wheat/gluten free version of this cake, as it is apart of my culture and feel excluded. Sorry to hear that, I don’t have a gluten free recipe. Just wondering if you could use burnt sugar as a substitute for the caramel? Yes, Beeneka you can use burnt sugar. My Mum’s family are from Guyana but lived here for the last 50 years ish and my Nana made ‘Guyana Black Cake’ every Christmas and at special occasions like my wedding. My Nana passed away just before Christmas last year and I promised myself a month ago I would try to make the cake as a surprise for my Mum and Auntie this Christmas. There has never been a recipe in existence as Nana always made it from memory like many favourites (Pepperpot being the other Christmas special) and I have been searching the Internet for a couple of months in preparation. So I’m excited to be using your recipe 🙂 Soaking fruit commences today!!! We have black treacle here which I guess is what my Nana would have used for the caramel, can you give me a rough idea how mush you use of your equivalent, like 1 tbsp or 1 cup I just want to get an idea so I don’t mess it up! Clare I have never used treacle so I won’t be able to give you an accurate measurement.Thank you for the wonderful story. Thank you for sharing your recipes. I have used quite a few. Silly question – for the teaspoon of baking powder- is it a measuring teaspoon or is it a regular teaspoon. To the young lady, Nadira Totaram, seeking an alcohol free version of the cake, there are alcohol free wines available in your local supermarket. If that fails, you can always utilize Concord grape juice. Baking today! Is you over temperature for a standard oven or fan assisted? It’s a very low temperature so I wanted to make sure! Hi Clare, it’s for the standard oven. Faneeza, it’s the standard measuring teaspoon. Help second year ting to make the brown sugar darkener. Each time I try the brown sugar turns into hard candy as soon as it cools. I have tried adding rum or wine at the end of the melting. Please tell me where I have gone wrong. Pat are you trying to make caramel? That’s great Leif! Very multicultural. You can absolutely scale back on the fruits. This mixture makes enough to have leftover for the next year or to be used in a fruit cake. Hi Summer,oops, thank for spotting that error. It is pronounced Gee-han. Hello Jehan, I tried most of your recipes and loved it all. Today I’m trying your garlic pork and black cake but I’m not sure of making the burnt sugar. I know you have to let it cool before adding it to the cake mixture but it gets hard…can I add wine to make it liquid? Would love to meet you since I live in Atlanta too! Best Wishes for the holidays. Does it matter if you use Brown sugar or white sugar to make the caramel? And does it matter if you don’t add cherries I have prunes ,currants ,raisins, and mixed peel. Thanks for the kind wishes Debbie. I’ve updated the recipe a bit since some of you are having an issue with the caramel. Add about 2 tablespoon of red wine after the sugar becomes dark and let it reduce to a syrup. I hope that helps. Hi Constance, you can use white sugar but brown sugar does give it a cake a different flavor. You don’t have to add cherries, add whatever mixture of fruit that you prefer. Since I haven’t tested the recipe using mixed spice, it would be difficult for me to recommend an amount. What I will say is you can probably try adding the same amount of mixed spice that the other spices add up to. I hope I’ve helped you answer your question. Hi Jehan thanks for answering my other questions but I have two more. I didn’t see the temperature you cook it on most cakes are 350 is it the same for this one and I am soaking my fruits but I put it in the fridge was I supposed to leave it out? I Vdub, sorry for the late reply. In the first line it says to preheat oven to 275 degrees. Cook it at that temperature. It is best to leave the fruits at room temperature. I’m making this for my sister’s upcoming wedding her finance is of Guyanese background and they requested this. I’ve never made it before. I have a question about the first phase with the fruit mixture and soaking in rum. Do you leave it soaking at room temperature or should you put the airtight container in the fridge for the 2 weeks and stir it up occasional? Thanks! Hi Marina, I leave it at room temperature. I would be trying your recipe for Christmas this year and would start the process once I have purchased all of the fruits this weekend. Could you clarify at what point do you add the bottle of 750 ml of rum to the cake? Is the 2 cups of rum used to soak the fruits deducted from the 750 ml bottle? Nan, use some of the rum to soak the fruits…just until they are covered. Then use the remaining rum as specified in the recipe….don’t use the entire bottle. Sorry about not being clear about that. I’m originally from Guyana but never learned how to prepare these dishes that I enjoy eating occasionally.. looking forward to cooking for my friends and family.. I have full confidence as you as my teacher..
Live your recipes and show!! Hv been following u on these awesome dishes! Any update to the black cake recipe available? I Dem to only come up with the 2011 version and it appears some instructions hv been left out, I do scroll to find it in comments but ws just wonder if u did update and I just didn’t find it. Thanks for an awesome job! Mela, thank you, it’s just recently updated a few weeks ago. Any suggestions on how to make the icing for the black cake? A few points about your recipe. The first thing you have to let your readers know is that when baking a kitchen scale is needed. No averaging when baking a cake. With the amount of fruit, butter and flour used, why 10 eggs and not 12? Lots of liquid is needed when the soaked fruits is combined the butter and eggs. If the mixture is too tight before adding the flour, then you will have a stiff cake like the one you baked there, which some people in Guyana would call a “dough boy”. Mixing of the batter is not easily explained in a recipe. Hi Reginald, using a kitchen scale does produce more accurate results but the average cook does not own a kitchen scale and most likely won’t just to make one recipe. The average cook owns mixing cups and the ingredients were weighed first and then measured. The fruits are soaked with enough liquid and if there isn’t enough liquid in the fruits that is easily corrected by adding the liquid to the batter. It doesn’t matter if the liquid is in the fruits or added directly to the cake as long as the cake has enough liquid and is the right consistency. As you can see from the video the mixture was not stiff before adding the flour but thank you for your opinions. Nuala, the icing is simply a royal icing. Any royal icing recipe will work.